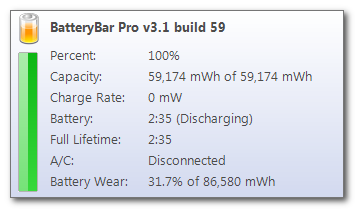 BatteryBar is a lightweight battery meter that shows the battery status in the taskbar. It is a simple, straight-forward, battery meter that monitors the status of your battery and displays your battery's status in the taskbar. It constantly monitors the status of your battery as you use your laptop. As it monitors your battery, it keeps historical data on your battery and provide you with a very accurate estimate of how much time is remaining. When you're running on battery, BatteryBar shows the percentage bar in green (> 40%), yellow (25-40%), or red (< 25%). The bar displays the time left on your battery in Hours:Minutes. * Statistical time prediction - I am working on a method to allow BatteryBar to keep a history of how your battery charges and discharges and use that to more accurately predict how long your battery takes to charge and discharge. Qweas is providing links to BatteryBar 3.5.3 as a courtesy, and makes no representations regarding BatteryBar or any other applications or any information related thereto. Any questions, complaints or claims regarding this application BatteryBar 3.5.3 must be directed to the appropriate software vendor. You may click the publisher link of BatteryBar on the top of this page to get more details about the vendor.